This would be good for my day bed. 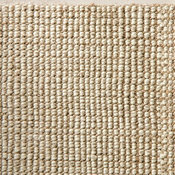 A chunky wool and jute rug also adds additional texture and warmth to a sunroom, this time under your feet. The pair of round bleached beechwood tables bring in a French look with their curved legs and gessoed finish. 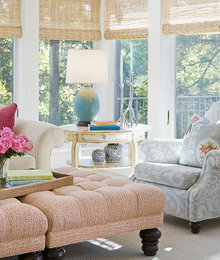 Eclectic glazed turquoise lamps add whimsy, balanced by crisp white shades. Finally, small details like the dark wood furniture feet add a hint of British colonial style and tie the room to the rest of the home. The designers added hints of casual lake-house elements, like this woven side table, here and there, without going the usual route of lots of wicker and stick furniture. Instead, they opted for very comfortable upholstered furniture. The result is that the room is a vacation-house-like getaway for the family right at home. 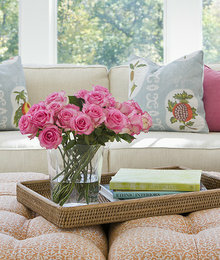 A pair of large tufted ottomans gives everyone in the family a spot to put up their feet and relax. “The homeowners love to enjoy The New York Times and The Wall Street Journal as well as their iPads out here,” Penfield says. “They are always moving the ottomans around depending on where they are sitting.” Located right off the kitchen, the room is a great spot for enjoying a cup of coffee or tea. As for color, Monet’s color theory explorations at Giverny provided the inspiration. From those French gardens, the designers picked dusty peach and soft blue for the larger pieces, then accentuated them with smaller daubs of bright pink and turquoise. “The bolder colors infuse the room with energy,” Penfield says. They ultimately opted not to go with sunlight-resistant fabrics, as the windows have UV glare protection, and because soft colors tend to fade in a pleasing, porch-y way. 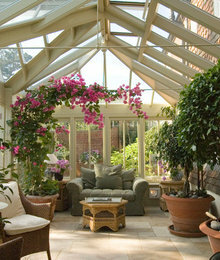 A Place to Grow Plants Bring the outdoors in by having a few potted plants and flowers in the sunroom. Since too much greenery distracts from the actual foliage outside, it's best to stick to one or two anchoring plants. 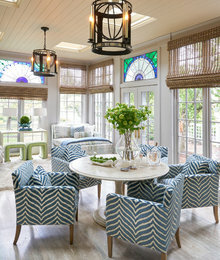 This sunroom goes a little further by having furniture fabrics and textiles that mimic the outdoor color palette. Despite its narrow dimensions, this covered porch's unadorned windows give unobstructed views of a nearby lake. 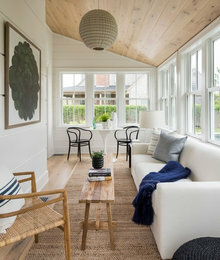 Judging from this sunroom's photo comments, it looks like the Houzz nation is divided when it comes to the ceiling: Some feel like the dark color makes the ceiling appear "visually heavy," while others like how the dark hue evokes a feeling of "being sheltered." I fall in the latter camp; I sometimes tend to feel too exposed in all-white sunrooms, so I appreciate how the dark shade adds warmth and coziness to the space. Rugs. Add plushness and texture over a hard, moisture-resistant flooring — such as tile, stone or sealed concrete — with a rug. Jute and cowhides will hold up particularly well. Decorations. If your sunroom has sealed windows and French doors, there is no reason to hold back from decorating it with your favorite home accessories. Framed prints, books, mirrors, candles, vases etc. will really kick it up a notch. A home office. If you have a table in your sunroom, you can use the space as a home office between meals. A supportive chair, a Wi-Fi connection and a view to your backyard will make for a productive morning. Greenery. 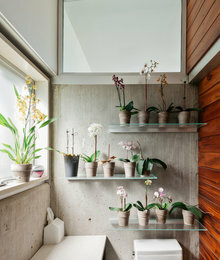 A transitional space between the indoors and outdoors begs for thriving potted plants as the connecting element. Privacy shades. 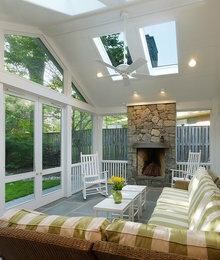 Sunrooms get sunny, of course. They tend to boast floor-to-ceiling insulated glass windows and doors. Even if you have high-quality windows and doors, the space may still get overheated. Curtains or shades are must-haves to make sure that you don’t overheat as you browse home design photos and drink iced tea on a lazy afternoon. Environmental controls. 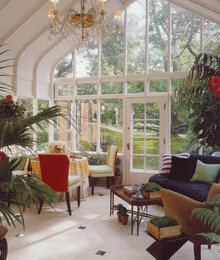 Most sunrooms are built without heating and air conditioning systems. But it's still nice to be able to cool down with a ceiling fan if the air gets too stifling, and to warm up with a fireplace on chilly nights. This space is representative of so many sunrooms. They are often long and narrow former side porches that have been enclosed and converted to indoor space. Here the beautiful wood on the ceiling and floor contrasts with the bright white walls. Style note: Interior designer Cynthia Hayes’ use of a narrow sofa and coffee table suits the room’s proportions and keeps a path open. Sun Control At certain times of day, the glare in a sunroom can be relentless. Houzzers were drawn to this sunroom’s bamboo blinds, which filter the light and add a natural texture to the room. The stained-glass transom windows, pendant lights and round dining table were also a hit. 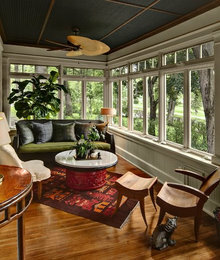 Style note: The cozy wide daybed in the corner is the perfect sunroom napping spot.